The strategy map is a cause-and-effect diagram of the four perspectives of the BSC. Managers use it to show how the achievement of goals in each perspective affect the achievement of goals in other perspectives, and finally the overall success of the firm. Since the top priority for most firms is financial performance (shareholder value in respect to public firms), the aim of the strategy map is financial performance with the other perspectives contributing to the financial performance in a cause and effect way. For many firms, learning and growth are the base upon which the firm is built. The reason is that learning and growth contributes to more knowledgeable employees that drive performance. Hence, these employees are better satisfied, are prepared to provide a higher level of customer service, resulting in customer loyalty and higher profits (the service-profit chain). Determine the mission of the company and its competitive strategy based on shared corporate values. 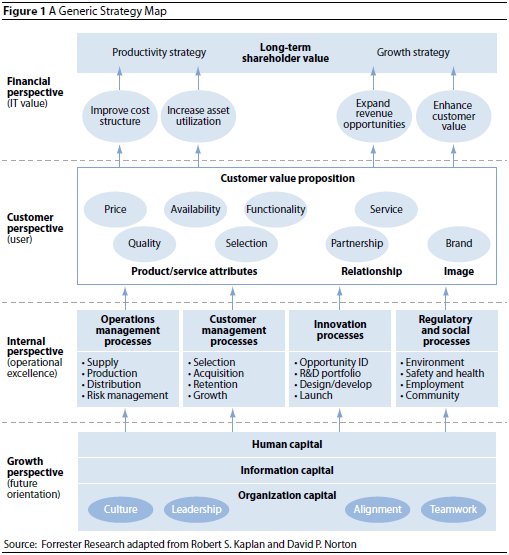 Use the SWOT analysis and value chain analysis to further refine the strategy. Create a balanced scorecard and strategy map for the company that identifies and links goals, management techniques, and critical success factors. Determine the measures, that when achieved, will show progress toward the desired goals. Below is a list of a few measures and techniques, although in practice there may be 100 or more measures. Additionally, the strategy map can be integrated into lean accounting or enterprise risk management.